After attaching your permit you will head away from the Hemel en Aarde Village onto the R320 towards Caledon. Within 200m, just past Whalehaven Cellar, you will see the single track to your left and that will lead you past the armco barrier (for those who are not comfortable with this section you can continue on the R320 till after the armco barrier where you will join the single track again – the same apply with your return). Follow the single track all along the Onrus River on your left. Enjoy the scenery and the lovely flowing river leading your way up the valley. After crossing the river over a wooden bridge keep left and soon you will find the first notable obstacle on your route. A short sharp incline will open your lungs and then you will follow some trails parallel to the Camphill dirt road. These trails are designed to keep you off the road and safe from traffic, but you are welcome to use the road, but remember to obey all traffic rules. Just before you reach Camphill farm and school you will join the road again. Next will follow your only climb of the route. Look out for the cement bridge crossing and stunning trails carved into the mountain that will take you to your highest point on route. Once you’ve reach the top of the climb a rocky decent will lead you down to Volmoed farm where some stunning stream crossings and trails awaits. Purpose build wooden structures to keep you out off the swamp will be sure to create lasting memories. Once we exit the Volmoed property we head back on some trails built on the shoulder of the R320. You might want to stop for a coffee at Plaaskombuis or even something to eat or just head back along the trails. You will cycle through some of Hamilton Russell’s award winning vineyards and then wind your way through the blue gums and some jeep tracks until you will do an amazing river crossing onto some of the most beautiful trails you will experience. This time the Onrus River will be on your left till you meet up with the wooden bridge you crossed about an hour ago. 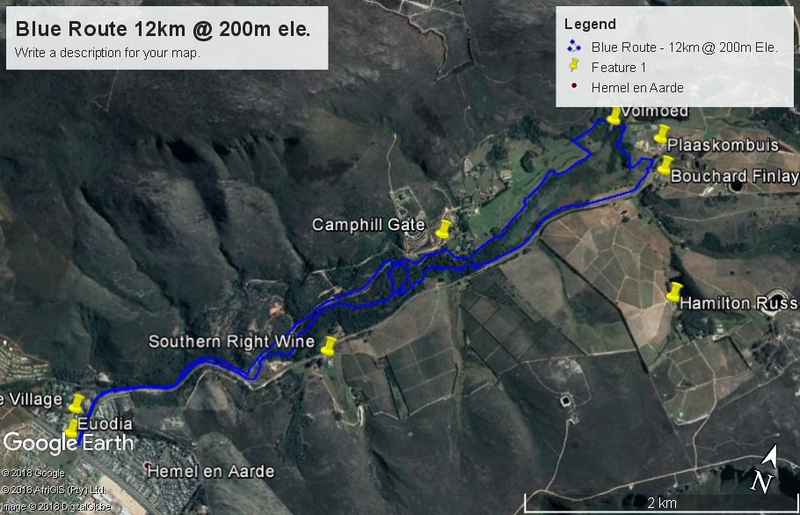 After crossing the bridge join the now familiar trail on which you started all the way back to the Hemel en Aarde Village. This trail is a must if you want to improve your skills of single track riding. It is simple, flowing and as exciting as you make it. The surface is not rocky (with one exception) and thus ideal for novices and intermediate cyclists. This route is also a great time trial route for those who want to push themselves for a sub one-hour ride.